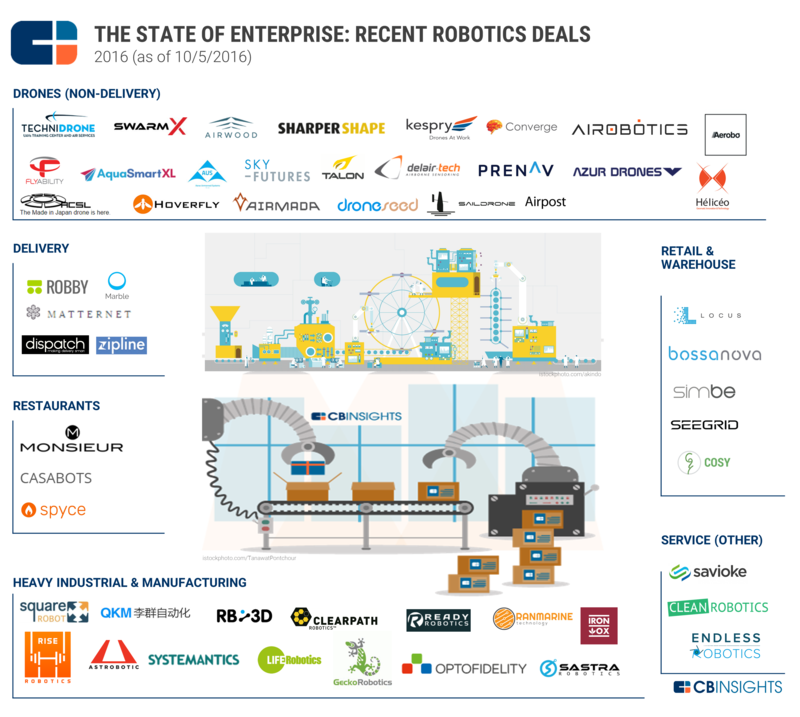 Enterprise-focused robotics startups have raised $259M across 60+ deals so far this year. Over 50 enterprise-focused robotics companies have raised $259M across 63 deals this year (as of 10/5/2016). These companies are building robots for industrial automation, manufacturing, warehouse automation, and restaurant services, among other tasks. At the current run-rate, deals to enterprise robotics startups are projected to cross 80 this year, beating last year’s record of 73. We look at how the enterprise blockchain world is developing, as well as where cryptonetworks could possibly go in the future. The market map below includes startups that have raised an equity funding round this year (as of 10/5/2016) and is not meant to be exhaustive of startups in the space. Please click to enlarge. Heavy Industry: This is a broad category that includes robots involved in a number of industrial automation tasks including manufacturing, assembly, agribusiness, robotic food inspection systems, and plant inspections. Startups here have raised over 70 deals since 2012. Companies that raised rounds in 2016 include Clearpath Robotics, Life Robotics, Square Robot, and Quotient Kinematics Machine. Drones (non-delivery): Drone startups focused on tasks like on-site inspection, surveying, and 3D mapping for a variety of industries like agriculture and construction have raised 27 deals so far this year (as of 10/5/2016), more than any other enterprise robotics category in 2016. For example, smart money VC CRV backed Israel-based startup Airobotics, which builds drones for industries including mining and oil & gas in a $28.5M Series B round in Q2’16. Lux Capital backed California-based Saildrone, which collects ocean data, in a $14M Series A round. Last year, one of the largest funding rounds was raised by China-based DJI Innovations—a $75M Series B round backed by Accel Partners. Though DJI builds consumer drones like Mavec and Phantom, it has also built drones for industrial applications, and so is included under this category. Delivery: This category includes unmanned aerial vehicles and ground robots focused on last-mile logistics, including delivering medicines and other goods to the homes of consumers. Startups here have raised over 15 deals since 2012, with deal numbers picking up in the last 2 years. San Francisco-based Zipline International announced a partnership with the Rwandan government to improve access to healthcare by delivering medications using a mini-robotic airplane. It raised $18M in Q2’16 from investors including Sequoia Capital, AME Cloud Ventures, and Google Ventures. Andreessen Horowitz invested in Dispatch in a $2M seed round in the same quarter. Most of the companies here are still in their early stages of funding, including Robby and Matternet. Retail & Warehouse: Pittsburgh-based Seegrid raised a $14M round in Q2’16, and another $12M round from Pittsburgh-based supermarket Giant Eagle in Q3’16. In retail, Bossa Nova Robotics raised $10.7M in Q3’16. Simbe Robotics, which built shelf-auditing robot Tally, raised funds from China-based hardware accelerator HAX. Restaurant: Robots in restaurants that can cook or serve customers have generated some interest over the years. Three companies have been seed funded so far in 2016: robot restaurant Spyce Kitchen, bar-tending robot Monsieur, and another cooking robot Casabots. Service (Other): Robots here are involved in a variety of service tasks, like lawn mowing for golf clubs. CleanRobotics raised funds from HAX for Trashbot, a trash-sorting robot for offices; Savioke, a service robot for the hospitality industry, raised $15M this year from Northern Light Venture Capital, Intel Capital, and EDBI, among others. You can read the entire analysis on deals to various robotics categories here. Want more data on robotics startups? Log in to CB Insights or sign up for free below.